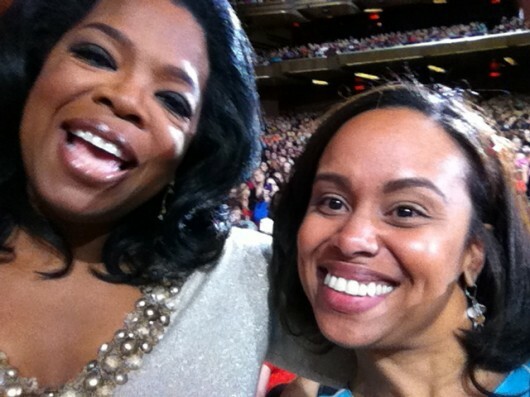 Eileen Z. Fuentes | How I Knew I’d Meet Oprah! 03 Apr How I Knew I’d Meet Oprah! It all started when I received a general e-mail notification from Oprah.com sent to all it’s subscribers advising us about an upcoming live taping of the Lifeclass series at Radio City Music Hall in New York City. Immediately I plotted with my co-worker to enter the lottery for tickets and kept the fact that I had done this to myself. I wanted no negative energy tampering with my chances. Soon after I got the message that I was selected. While I was excited about winning, I was a little bummed that I was to sit in the upper mezzanine on the third level. Two weeks later, I received another notification asking me some really difficult questions. I made 3 attempts to respond to them but had to stop because I kept getting stuck, then finally I just got it done. These were not easy things to put into words. What was your most profound breakthrough? What in your life is causing you pain right now? What is keeping you from living your best life? What do you believe is your life’s purpose? Are you fulfilling it? Next thing you know, I get another communication indicating that due to some production changes, I was moved to the orchestra seats on the first level. I guess I did a hell of a job on those questions! From that point on, I really got serious about setting my intention and visualized myself talking to my Shero, Ms. Oprah Winfrey. There was not a night I didn’t pray for our long-anticipated meeting. When I went to pick up my tickets the day before, I was given a bracelet that other audience members on line did not. Upon arrival to the historic venue, I was not required to wait on the ridiculously long line with people from all over the world. Then I was ushered to the second row in the closed off section in front of the stage. The topic was spirituality and her guest was the amazing, Deepak Chopra. Perez Hilton also made an appearance. Before I knew it, Oprah came by to say hello during one of the show’s breaks and I knew this was my opportunity. With the look of fury in his eyes, the security guard saw me preparing and quickly warned me that I was not to request any pictures. What he didn’t know is that the phone was ready… I was ready. As Oprah spoke to the ladies in front of me I stood up, looked into her eyes and simply whispered “thank you” (for so many things that it would have been impossible to list) and then proceeded to ask for a hug. She lovingly accepted and I could feel the love radiating from her heart to mine. I then asked her for a picture and after she personally made a few adjustments to the positioning of the camera, she smiled and brought me closer so that both us would be captured in the image. You could tell how happy I was by looking at the picture. I can only recall her posing for one other of the 5000 audience members. Not realizing that my friends were watching it live on the web, my phone went bananas! So many people were trying to contact me at precisely 3:56pm, it literally shut off. It took me a while to recover from the magnitude of what had occurred. I cannot remember a single thing that happened in the moments that followed. As I drove home with the radio off, I just cried. If you remember only one thing from the post, let it be this… no one and no thing can stop you from your dreams. As Deepak Chopra said, the only moment you have is NOW! Be sure to check out the TV broadcast on April 23rd at 8:00pm EST on OWN. What a momentous blessing, Eileen. I can feel the power emanating your words. May that one moment, and all the sacred ones leading up to it, be with you forever. Dream big! Thank you Aqiylah. This was definitely in divine order! This literally made me cry. I have chills going down my spine. DREAM BIG!!!! I love this. Thank you for sharing. I needed this renewal of faith this morning. Awww thank you Tasha, I appreciate you for sharing my immense joy! This is trully awesome! Oprah and you make an great pair! This is EPIC..i say it again! LOL at Epic! WE are going places, amiga! This post is and will be a blessing to many. I am so proud of you for taking off the fear and letting God guide you toward your destiny. We can do all things through him and no man can stop what God will have planned for us. Congratulations!!! The world is ours and I love you sooooo much! I guess we should start working on the Washington Heights version of lifeclass… LOL! Thank you very much. That means a lot! Thank you for sharing this story, Eileen! This just flows into my confirmation of things that I must do to change my story by having more faith in life and myself. This also flows with what Tony Robbins talked about in Oprah’s lifeclass about your story. Thank you for sharing your story! It indeed touched me and helped me in changing my story to a woman full of faith in her dreams and in life!!! Faith will take you far… I’m glad this story helped to enhance yours. Much love to you, Lori! Eileen you are an inspiration, Im reading your article right now and Im tearing, I really dont know How I would have answered those questions myself. Thank you for being such a positive light. If you haven’t thought about those questions, now is a great time. It will certainly help to put all things in perspective. Keep going, amor! You are my inspiration! Thank you for sharing this momentous moment with us and letting us see how our dreams can manifest at the highest level! I remember your tweet that you were going some weeks ago. Who knew it would turn out like this! Indeed, you are a V.I.P. Deepak and Oprah! KaPow! Mwaah! Kapow! I most certainly took your love with me the whole time. Thank you Hakikah (again) for all your support. You mean the world to me! Amazing Eileen! Extremely happy for you. Eileen – I am SO happy for you! You’re such an inspiration! Keep on rockin’, girl! Rocking and rolling, my dear. Let’s change the world! Wow, Eileen!!! I am so very excited for you, proud of you and thankful for all that you do to be well, live well and inspire the world to believe that EVERYthing is possible! Everything is possible… In the words of my idol, Ms. Oprah Winfrey, “This is the one thing I know for sure”. I had no doubts in my mind that this was going ot happen–maybe not the details–I know how important she is in your life and how determined you are. Good stuff Eileen, you are made up of lots of good stuff and we love you for it! Thanks Edwin… I kept my eye on the prize for many things in my life. I’m so fortunate to have the love and support of my family. Thank you for that and thanks for the compliment on the blog. It has been a labor of love! Eileen, I’m so proud of you and inspired by your true beliefs. Very few if anyone else has this story and for me, currently in a spiraling out of control time, it was great to see this as a way to refocus and believe in the power of intentions. Thanks Eileen- you’re the best and keep up the great writing. I am loving The Speach! Hey Eileen that’s terrific. I must confess I’ve been secretly reading your stuff on the uptown collective for months. The piece on longevity has been great, and the other day at the hospital I couldn’t help but over hear your conversation with an elderly man of 90-something, that by the way had more life than most 20-somethings. With this said I have to tell you that you are inspiring in your own way and I am so very happy for you that you met the person that inspires you! WOW! Thank you Dalba… I am SPEACHless 😉 I actually interviewed him the following weekend and he is my next story! I appreciate your compliments… so so grateful! Wonderful article! I am very proud of you… will share with my peeps! Thanks Kiki… does that mean mom loves me more than you now? LOL! I love what you wrote and that you shared it. I was there for the evening performance. It was an honor to be in the same room as Oprah. It sure was. Don’t you agree she is a sincere soul? I love her so much more now that I’ve had the opportunity to speak to her. Love every cell in her body! I just want you to know that I am very happy for you, and it is amazing how much I have learned from you. You are an amazing women. I am very proud to be your tia. May God continue to Bless you and your family. Thank you Tia. I’m so happy to hear that you are learning. From day 1, you’ve always supported my nutrition craziness! I hope you continued health today and always. Tania, I need you closer… that is all. Happy tears are good! Thank you so much Buzygurl! Wow!! you just made me cry what a great uplifting story.You are truly an amazing person! Im sure she felt your positive energy, if she can only know how many lives you have inspired and keep inspiring. You go SUPER WOMAN!!!! The SPEACH » See Oprah’s Lifeclass (the one I attended) Tonight! POWERful! I am a true believer in the power of manifestation. You have a message to share and your process of getting to Oprah is a part of that. Many blessings! Thank you Takeyah and many blessings to you too. Eileen, Eileen, Eileen!!! How did I miss this??? So proud of you and the world you have opened up. Are you really that same shy woman I met 2 years ago??? You blow me away with your courage and your vision! Miss you! That’s okay Karen. There’s a lot going on in our healthnutty world. Thank you so much for always being so loving and supportive. I miss you too. This is wonderful, I don’t know you Eileen, but I can imagine all the big things you will contribute to those around you! Congratulations. I am so inspired by this story, by your energy, by your life! Your tide of positivity (just like Oprah’s), lifts all boats around you! Keep inspiring us! Melissa ❤❤❤ Thank you so much. I miss you. I truly honor your friendship and your encouragement. So so grateful for you. I absolutely LOVE this story! I love how focused and firm you were on getting to that moment. You totally deserve this! What a wonderful experience! Hi Angelica! I am humbled that you left me a comment… I am such a fan of what you’ve created. From the bottom of my heart, I truly thank you! Thank you Jenné! After seeing you in action, I know you will achieve all you set your mind to. WOW wow wow Eileen! I just read this article for the 1st time (2yrs later) I had no idea you met Oprah in 2012! You are simply AMAZING & UNSTOPPABLE!! Like you, I believe nothing is impossible with GOD! You are TRULY BLESSED and a Beacon of Light & Hope to so many women. Wishing you many more Blessings of Great health, peace, joy & prosperity! Much love to you, hermana! I’m glad you felt the joy and authenticity in my words. You have no idea how much I admire you, Nalie. Stay blessed.